… where it’s not about the sleds, it’s about the people. Join hundreds of Scorpion fans for the 14th annual Scorpion Homecoming & Ice Fishing Contest, brought to you by the Cuyuna Lakes Chamber of Commerce and the Sno-Serpent Snowmobile Club. The 2018 Scorpion Homecoming will feature the WHIP! The sparkling-blue sensation from model year 1975! The agenda and tone of the event is expected to be similar to prior years. For a recap of prior events, browse the Scorpion Homecoming launch page. Scorpion Homecoming is a casual, free and fun event. Sled registration is completely complementary. No formal provisions are being made for swap or race activities. Attendees are however encouraged to support the sponsors by purchasing a raffle ticket (excellent prizes awarded - need not be present to win), patronizing the concessionaires and purchasing an official 2018 Homecoming button. All Scorpions, as well as Scorpion-manufactured brands are welcome, including Trail-A-Sled, Sno-Ro, Sears, Sno-Craft, Brut and Massey-Ferguson. Machines need not run to be displayed. And don't forget to sport your Scorpion-themed apparel! Need more information? Use our Contact form. Support this event by purchasing your official Scorpion Homecoming 2018 button at the on-ice warming tent. At the 2018 Homecoming we celebrate not only the 1975 Whip, but also all other machines manufactured by the Crosby-Ironton based firm during its 20+ year existence. Only $4.00! The 2018 event will feature the sparkling-blue Whip from model year 1975. Sporting the two-cylinder Cuyuna engine, these innovative forward-mounted snowmobiles quickly gained a reputation for style, duability and fun. Even today. the 1975 Whip is among the most popular sleds ever manufactured by Scorpion. If you have one, regardless of condition, bring it out and show it off! During the event, please actively post with the hash-tag #scorpionsnowmobiles #scorpionhomecoming, Instagram user name @scorpionsnowmobiles and check-in on Facebook under the place name "Scorpion Homecoming." A more formalized judging process will continue for 2018. Scorpion Homecoming is independently judged by experts within the antique and vintage snowmobile hobby - the Antique Snowmobile Society (A.S.S.). Feature Sled - For those displaying a 1975 Whip, a HUGE number of trophies will be awarded, including the traditional 1st, 2nd and 3rd places, as well as FIVE honorable mentions! Don't miss this opportunity to bring-home some beautiful trophy hardware. Upon your arrival, visit the Homecoming on-ice support tent for your complimentary sled sign, commemorative button ($4), and other Scorpion merchandise. For your comfort, the support tent also doubles as a warming facility. A limit amount of assorted Scorpion-related merchandise will be available within the support tent. Cash only please. Quantities limited. No pre-orders or Internet orders - first come, first served. 10:00 AM to 2:30 PM. As always, on-ice driving and parking is at your own risk (ample nearby street parking is available). For your convenience, Memorial Park does have an excellent low-angle ramp to the ice surface. See the pre-event announcements section of this page for last minute information. A dedicated display area will be set-up adjacent to the ice fishing area on Serpent Lake just offshore from Memorial Park. Although welcome, no formal provisions are being made for swappers (and no fees are accessed). All swappers in attendance are asked to set-up around the perimeter of the display area and not within the snowmobile display lines. A dedicated area for 1975 Whips will be set-up near the display area entrance. Please place all 1975 Whips in the designated area. The display area is reserved specifically for Trail-A-Sled, Scorpion and other brands directly manufactured by such. Other antique and vintage brands are welcome (but are asked to please set-up around the perimeter of the display area). Local ride-in sleds are encouraged! Completely on-ice, this optional low-speed ride will circumnavigate Serpent Lake for approximately 8 round-trip miles. Support vehicles may not be available, so plan accordingly. Assuming safe ice conditions, the ride will proceed with or without snow. Participants below the age of 18 are subject to Minnesota's helmet law. Please have your sleds in good running condition. Vintage snowmobiles (25 years old or greater) are exempt from state license requirements while participating in this event. Held at a world-class local collection, this event is an absolute must for Scorpion fans. Rare vintage video will be on display. Directions to the open house are available at the on-ice Homecoming booth. Complimentary snacks and refreshments will be provided. For lodging and dining information, see the Chamber's web site. Extensive alternative lodging is also available in the Brainerd Lakes area, generally 16 miles southwest of Crosby-Ironton on Highway 210. Scorpion Homecoming is an open and active event. Your presence at the Homecoming implies consent to permit Scorpion Online to photograph, record, film or videotape your likeness and to publish it on our web site and other publications for artistic and non-commercial promotional purposes. By your presence, you agree to release Scorpion Online from any liability resulting from publication of your likeness. Requests to remove a particular picture bearing your likeness will be honored on a best efforts basis. In keeping with the 1975 Whip theme, feel free to wear your favorite Chuck Connors western wear! (Particularly the western hat and blue lambswool jacket.) Hollywood star Chuck Connors was a promotional fixture for Scorpion during production of the Whip! His rugged persona was a perfect compliment to Scorpion's western-themed advertising campaign. One hundred and twenty snowmobiles were on display this past Saturday at the 14th Annual Cuyuna Lakes Ice Fishing Contest and Scorpion Homecoming. Several hundred participants enjoyed a light snow shower and a strong showing of feature machines, the blue metal fleck 1975 Whip. 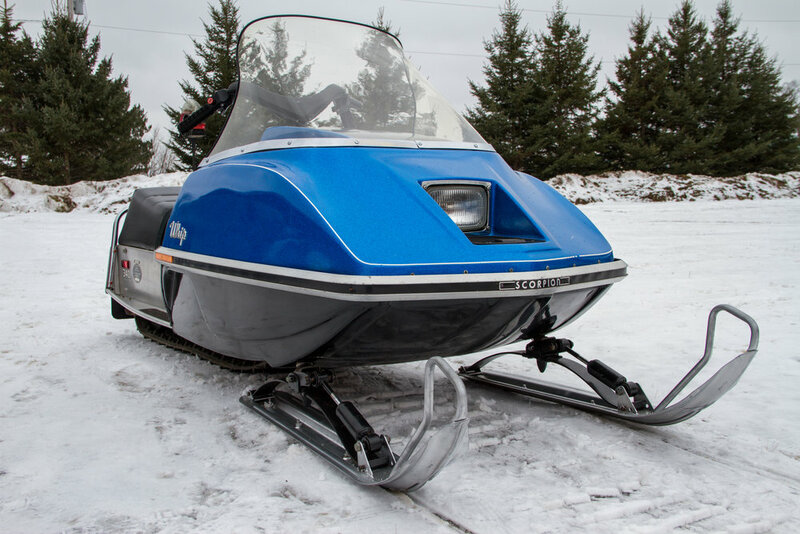 Featuring a forward-mounted engine, wide ski stance, aluminum tunnel and the legendary Cuyuna engine, a beautiful row of these locally manufactured snowmobiles was on display. And a hearty thank you to all the volunteers who helped to make this another successful event, including: Cuyuna Lakes Chamber of Commerce, Sno-Serpents Snowmobile Club, Miss Crosby-Ironton Scholarship Pageant, Antique Snowmobile Society, and numerous family and friends. Select the image below to follow this event on Facebook. In the final days preceding the event, late-breaking announcements will be posted to this area. If you plan on attending, please check this section accordingly. CAUTION! Footing for Cuyuna Lakes Annual Ice Fishing Contest & Scorpion Homecoming is expected to be rough and slippery. Sturdy boots and ice cleats are recommended. Come to Scorpion Homecoming 2018 and show-off your Stinger - then catch yourself a fish at the adjacent Annual Serpent Lake Ice Fishing Contest. Great prizes in several categories! Together with Annual Ice Fishing Contest, Scorpion Homecoming is intended to be enjoyed by the whole family. The adjacent Annual Ice Fishing Contest boasts an on-ice dance contest, raffle prizes, on-ice concessions and themed fishing groups - this is a great day to celebrate Minnesota winter living! Over 1200 holes will be drilled and waiting for your line to be dropped at Noon on Saturday, February 3rd. Win cash prizes for fish of all species. Even a cash prize for the smallest fish! Enjoy cash prizes and concessions on the ice! $10 entry fee gives you one hole, plus a chance at the raffle. 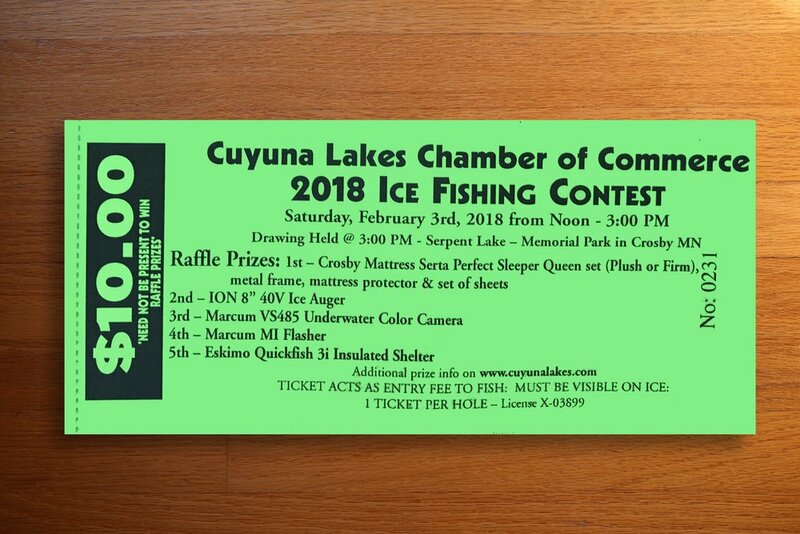 Raffle Ticket Prizes: 1st, Crosby Mattress Serta Perfect Sleeper Queen set (plush or firm), metal frame, mattress protector & set of sheets; 2nd, ION 8” 40V Ice Auger; 3rd, Marcum VS485 Underwater Color Camera; 4th, Marcum MI Flasher; 5th, Eskimo Quickfish 3i Insulated Shelter. City Of Crosby For Their Continued Partnership & Donation To This Event! Big, Big Thank You To Oars – N- Mine For Their Continued Support & Partnership - They Drill All Of Our Ice Fishing Holes! Range Disposal Service For Donating All Of Our Garbage Receptacles! 3rd Place Pan Fish: AJ Metalworks, Inc.
Crosby, Minnesota is located on the eastern edge of the Brainerd Lakes Area (115 miles north of Minneapolis, 90 miles west of Duluth, 15 miles northwest of Brainerd). Crosby's Memorial Park on the northwestern shores of Serpent Lake (Highway 210). If you are unsure of the location, check-out the map on the Homecoming launch page. Enter Memorial Park through the west-side entrance along Hwy 210, then proceed to the boat ramp where volunteers will assist you. Since it's inception, Scorpion Homecoming is brought to you in part by the great people at the Cuyuna Lakes Chamber of Commerce. Thank you for your support! Logistical support for Scorpion Homecoming is brought to you in part by the Sno-Serpents Snowmobile Club. Founded in 1973, the Sno-Serpents maintain over 80 miles of Minnesota's best snowmobile trails, right here in the Cuyuna Lakes. Consider supporting the club by becoming a member today!